DURHAM, NC; December 18, 2013—One of the first areas of the brain to be attacked by Alzheimer's disease is more active when the brain isn't working very hard, and quiets down during the brain's peak performance. The question that Duke University graduate student Sarah Heilbronner wanted to resolve was whether this brain region, called the posterior cingulate cortex, or PCC, actively dampens cognitive performance, say by allowing the mind to wander, or is instead monitoring performance and trying to improve it when needed. If the PCC were monitoring and improving performance, increased activity there would be the result of poor performance, not the cause of it. 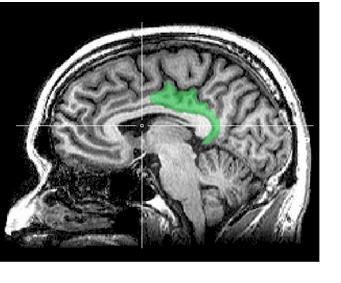 The PCC connects to both learning and reward systems, Heilbronner said, and is a part of the "default mode network." It lies along a mid-line between the ears, where many structures related to rewards can be found. "It's kind of a nexus for multiple systems," said Heilbronner, who is currently a postdoctoral researcher in neuroanatomy at the University of Rochester. "As this area begins to deteriorate, people begin to show the early signs of cognitive decline—problems learning and remembering things, getting lost, trouble planning—that ultimately manifest as outright dementia," said Michael Platt, director of the Duke Institute for Brain Sciences, who supervised Heilbronner's 2012 dissertation. Their findings appear Dec. 18 in the journal Neuron. Heilbronner's experiment to better understand the PCC's role in learning and remembering relied on two rhesus macaque monkeys fitted with electrodes to read out the activity of individual neurons in their brains. Their task was akin to playing video games with their eyes. The monkeys were shown a series of photographs each day marked with dots at the upper left and lower right corners. To get a rewarding squirt of juice, they had to move their gaze to the correct target dot on a photo, and they learned by trial and error which dot would yield the reward for each photo. Each day, they were shown up to 12 photos from an assortment of Heilbronner's vacation snaps at Yellowstone National Park and the Grand Canyon. Some of each day's images were familiar with a known reward target, and others were new. As the monkeys responded with their gaze, the researchers watched the activity of dozens of neurons in each monkey's brain immediately following correct and incorrect responses. They also altered the amount of juice dispensed in some cases, creating a sense of high-reward and low-reward answers. If the PCC actively dampened performance, the researchers would expect to see it active before a choice is made or the feedback is received. Instead, they saw it working after the feedback, lasting sometimes until the next image was presented. Neurons in the PCC responded strongly when the monkeys needed to learn something new, especially when they made errors or didn't earn enough reward to keep motivated. The researchers also ran the task after administering a drug, muscimol, that impaired the function of the PCC temporarily during testing. With the center inactivated by the drug, the monkeys could recall earlier learning regardless of the size of the reward. Learning a new item was still possible when the reward was large, but the monkeys couldn't learn anything new when rewards were small. "Maybe it didn't seem worth it," Heilbronner said. The dampening experiment also reinforced what the researchers had seen in the timing of the PCC's response. If this center's role is to let the mind wander, performance should have improved when the muscimol was administered, but the opposite was true. Heilbronner concludes that the PCC summons more resources for a challenging cognitive task. So rather than being the cause of poor performance on a task, PCC actually steps in during a challenge to improve the situation. "This study tells us that a healthy PCC is required for monitoring performance and keeping motivated during learning, particularly when problems are challenging," Platt said. Heilbronner is now interested in finding out whether the PCC is more important to learning than it is to recall, and how motivation interacts with PCC abnormalities seen in Alzheimer's disease. "Causal evidence of performance monitoring by neurons in posterior cingulate cortex during learning," Sarah Heilbronner and Michael Platt. Neuron, Dec. 19, 2013.